Avalon Partners, LLC and Catalyst Development, LLC have successfully completed the conversion of four historic buildings into 16 market rate and 4 affordable rental apartments on the upper three floors with approximately 9,000 rentable square feet of ground floor retail and office space. The combined 26,500 square foot Julia Street Buildings are located in the Warehouse District of New Orleans, Louisiana, on one of the most desirable and picturesque tree-lined streets in the area. The project offers affordable retail and commercial space to local entrepreneurs and small businesses while providing much needed premier housing in the Central Business District. Adler Development, LLC renovated a 109,720 sqft warehouse that was severely damaged by Hurricane Sandy on October 29, 2012. The storm ripped two-thirds of the roof off the building, and damaged the remainder. 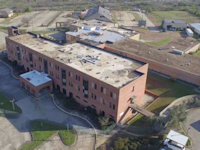 The storm caused extensive water damage to all of the building systems (HVAC, lighting, and fire suppression), destroyed the insulation and made the offices uninhabitable. The renovation work consists of a new roof, designed to withstand 120 mph wind speeds, new awnings and roof metal, energy efficient lighting, new heating systems, a new ESFR fire sprinkler system including a pressure-boosting pump, a new water service to feed the building, and general reconstruction of the office space. 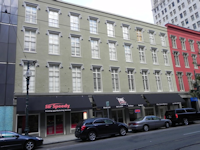 Philadelphia Management & Companies has successfully converted the historic structure into 33 luxury market rate rental residential apartments and 12,000 square feet of ground floor retail space. Located adjacent to the $85 million Centre Point Development and across from the $65 million Hippodrome Theatre on Baltimore's West Side, the renovated Abell Building completed the revitalization of the Hippodrome Theatre block and added a complimentary use to the theatre and commercial district. The 6-story Abell Building is one of Baltimore's finest and most iconoclastic historic buildings. The 1870s-era brick and marble building was built by legendary Baltimore Sun Founder Arunah Abell in the Italianate style, and commands a striking presence on West Baltimore Street. Ag Processing Inc. (AGP) has successfully completed the development of an integrated grain and oilseed storage and export facility at Terminal 2 of the Port of Grays Harbor in Aberdeen, WA. Serving as a gateway destination for US grain exports, the Storage & Export Facility consists of a railroad receiving building and six concrete silos with a storage capacity of 52,450 metric tons (2,065,000 bushels) of grain and oilseed. Alongside the Port's new state-of-the-art ship loading facility, the storage facility is a key component of a joint plan by AGP, the Port of Grays Harbor, and Pacific Railroad to develop a modern deep-water port with strategic access to Pacific Rim markets. Ag Processing Inc. has headquarters in Omaha, NE and is owned by approximately 180 local cooperatives representing over 250,000 farmers throughout the Midwest. The Maine Woods Pellet Company, an existing successful vertically-integrated, third-generation family owned white wood pellet manufacturing and timberland business based on a 55-acre site in rural Athens, Maine, added a new all-in-one biomass processor, boiler and steam turbine power generation unit to help reduce its energy costs. The project gives the pellet business the ability to continue and significantly increase its 100,000 ton per year production at a time when energy costs have become the one of the most problematic and limiting factors. The project has the added benefits of using locally harvested waste wood biomass as its fuel source to generate electricity and to provide thermal output to be used as part of the wood pellet manufacturing process. Melon Green Realty Group transformed these two Brewery Park buildings into 89,650 square feet of commercial space with 8 residential units. The 68,150 square foot Master Street property is leased to an Art Center for retail and storage space, while the smaller 31st Street building houses several community businesses as well as 8 residential units. The Brewery Park Buildings are located in the Brewerytown District, one of North Philadelphia's most historic areas. The Brewerytown District features ornamented red brick buildings typical of Philadelphia architecture of the mid-1870s. The neighborhood is also home to Girard College, Boathouse Row and the Philadelphia Art Museum. Henderson Holdings, LLC converted the building into approximately 45,000 square feet of restaurant, retail and office space, of which Dock's restaurant and entertainment complex comprises over 35,000 square feet. The former Capitol Department Store is the most significant historic department store in Fayetteville, and one of the most significant buildings in southeast North Carolina because of its striking Modernist facade of marble and mosaic, its grand second story balcony, and immense convex window. The rehabilitation of this historic building also created a lasting economic impact in a census area with severe poverty and unemployment. Rooms To Go, the largest independent furniture retailer in the United States, developed a new 1.2 million sqft facility which serves as its primary distribution and processing center for online deliveries throughout the eastern United States. At the facility, furniture components are received, assembled, warehoused and ultimately shipped directly to customers’ homes. The facility also includes a state-of-the-art 60,000 square foot retail showroom and outlet center, ancillary office space and a truck wash.
United Properties Investment, LLC has successfully completed the Ford Center redevelopment project by transforming a former automobile factory into a 269,000 square foot, LEED-certified Class A office building targeted to creative services businesses. The Ford Center redevelopment project returned a 95-year-old, dilapidated Ford Assembly plant to its historic condition for lease to office tenants. It is the first office project in the "North Loop" neighborhood for over 10 years and the aesthetically pleasing redevelopment and environmentally friendly design will serve to stimulate other economic development in this historic neighborhood. Transportation Consultants, Inc. has successfully developed 200,000 square feet of warehouse and distribution center space and the installation of an integrated railcar unloading system on 27 acres of unimproved land acquired from the Port of New Orleans and adjacent to the 9th Ward. 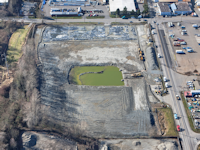 The development complex includes the use of 10-to-15 acres serving as a containerized depot facility for Transportation Consultants, Inc. and another 4 acres serving as a distribution center for Triton Stone Group of New Orleans, LLC. A 150,000 square-foot warehouse facility was constructed to support both endeavors while 50,000 square-foot warehouse was constructed as a distribution center for a regional restaurant supply company. In addition, a New Orleans Public Belt railroad spur and railcar unloading system has been installed as part of the containerized depot facility for bulk railcar unloading. The Project includes the historic renovation of the Greystone Hotel, designed by renowned Art Deco architect Henry Hohauser in 1939, and the redevelopment of the Santa Barbara Hotel, designed by Art Deco architect Norman Giller in 1947. The former Greystone Hotel and Santa Barbara Hotel have been abandoned and viewed by the local community as derelict buildings for over 10 years. The highly visible and well trafficked intersection of 20th Street and Collins Avenue in Miami Beach is blighted by the current condition of the properties. The Greystone Hotel Redevelopment Project enjoys tremendous support from the immediate neighbors and surrounding neighborhood community members. The Project will catalyze the creation of nearby services for its patrons, including additional restaurants, coffee shops, retail stores and services like dry cleaners, flower shops, etc. These new enterprises will create additional employment opportunities for area residents and encourage a vibrant, livable and walkable city. Robert Fresh Market LLC has successfully rehabilitated a vacant 21,000 square foot building into a new full-service grocery store. The building formerly housed a successful community grocery store which was severely damaged during Hurricane Katrina and never reopened. The Harrison Fresh Market provides a critical service to the Lakeview neighborhood while contributing to the ongoing recovery of New Orleans from the effects of Hurricane Katrina. In addition, the restoration of this blighted building greatly improved a vital area within the Lakeview neighborhood retail hub. Currently, there are three grocery stores in the New Orleans area under the Robert Fresh Market moniker with approximately 250 employees. As part of their ongoing mission to provide supportive services to the low income residents of the Harlem Heights neighborhood, The Heights Foundation, a 501(c)(3) charitable organization, is constructing a Cultural Arts and Community Center which will offer family and community development programs and education and wellness opportunities as well as access to the cultural and expressive arts. The 2-story Harlem Heights Cultural Arts & Community Center will offer a variety of programs for children and adults, including academically supportive after-school programs, early learning and parenting classes, family advocacy services, connections to social services, computer, literacy and GED classes, career development programs, and job training in the culinary arts. The Community Center will also provide a daily hot lunch to local senior citizens, a medical clinic providing affordable healthcare services in partnership with the Lee County Health Department, and a 250-seat auditorium for community celebrations and art events. Isis Development, LLC is rehabilitating four historic buildings into a market-rate apartment community consisting of 55 rental apartment units, 12,906 square feet of ground floor commercial space, and 43 adjacent parking spaces. The two sets of historic buildings are located approximately 220 feet apart on East Front Street, in the heart of downtown Hattiesburg. The rehabilitated buildings will offer a mixture of studio, one, and two bedroom units with a ground floor retail component that will include 1,275 sqft of commercial space cheap replica Cartier watches dedicated to the City of Hattiesburg who will offer children educational programs focused on the arts, reading, science and entrepreneurship. The restoration of these blighted buildings is expected to catalyze additional development in the downtown Hattiesburg. Food Lifeline has successfully completed the 130,000 sq-ft Hunger Solution Center which replaced the previously leased buildings in SODO and Shoreline that were operating at full capacity. The Hunger Solution Center completely transformed Food Lifeline by allowing the organization to grow its annual food distribution from 32 million meals (39 million pounds) to over 83 million meals per year by 2025 (100 million pounds) and implement programs, partnerships and community-mobilized solutions that will stop hunger in Western Washington. In addition, the new facility creates a gathering place designed to engage and inspire the entire community to learn more about the issue of hunger, take action and advocate for positive change. Chris Foley and Polaris Pacific has completed the conversion of the historic church into approximately 22,000 square feet of creative office space with approximately 10,000 square feet of outdoor community space. The property has been part of the community for over 150 years. After the 1989 Loma Prieta Earthquake, the property was red tagged (deemed uninhabitable) by the City and vacated by The Archdiocese of San Francisco. In 2007, the Project Sponsor acquired the project with the initial idea to redevelop the property into a residential project. However, the City and preservation community wanted the property to maintain its original character. As a result, based upon their feedback, the Project Sponsor spent more than 4 years obtaining the necessary approvals to transform the building into office and community assembly space with a café. Triangle Equities Development Company, LLC is transforming this long vacant site into a transit-oriented, commercial and residential project and is catalyzing the capital investment necessary for the community to achieve a full recovery from the devastation wrought by Hurricane Sandy in the Fall of 2012. Phase 1 construction includes the development of a 60,000 sq-ft, three-story retail building along Bay Street that incorporates the Lighthouse Depot’s historic brick perimeter wall into the building façade and a 118 unit residential tower with 20% of the units permanently affordable at 60% AMI. The retail building will be anchored by a NYC FRESH program grocery store that will provide nearly 15,000 square feet of supermarket space to a community in a USDA-designated Food Desert area and a co-working space which will facilitate entrepreneurship and small business job creation. The project is projected to create approximately 298 temporary construction jobs and 264 new full-time permanent jobs, while retaining 76 full-time jobs in a census tract with a 14.4% Unemployment Rate and a 21.9% Poverty Rate. 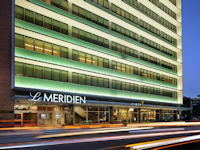 Development Services Group, Inc. has successfully completed the conversion of the historic, 21-story Melrose Building into 255-room Le Meridien Houston Hotel. The Project features an extensive list of first-rate amenities and finishes indicative of a full service hotel, including a state of the art reception/lobby along with onsite concierge services, a rooftop pool that opens to an outdoor sundeck, as well as a rooftop viewing area. There is approximately 8,000 square feet of meeting space, including a penthouse ballroom, ballroom pre-function area, and business meeting rooms. In addition, the Project has a signature restaurant and bar as well as an Internet lounge for hotel guests. The Fidelco Group created two modern mixed-use buildings in order to retain and attract tenants that provide diverse services to the Newark community, in the media, legal, engineering, community-service and restaurant industries. While the newly constructed building includes 3,500 sqft of retail (ground floor), 675 parking spaces (floors 2-8) and 70,000 sqft of office space (floors 9-10), the renovated building includes 4,000 sqft of retail space (ground floor) and approximately 110,000 sqft of office space (floors 2-6). The Newark Call Center project is located in a federally-designated Hurricane Sandy Major Disaster Declaration Area and cited by the Mayor’s Office as a key catalyst for recovery. A vital component of the Project is that a significant portion of the newly created jobs are intended to be filled by residents of Newark through partnership with the Newark Workforce Investment Board (‘NWIB’) which is a community-based non-profit that provides a localized, full-service employment and training system to make programs and resources easily available to residents and employers. The project will support numerous high-quality jobs, bring additional economic activity into downtown Newark, and catalyze additional development in the Newark CBD. Wuhl Shafman Lieberman, Corp. is in the process of creating a modern cold-storage warehouse with the capacity to process approximately 40 million packages of fresh produce annually, which will be distributed to more than 400 existing ShopRite, A&P, and affiliated supermarkets throughout the Northeast Corridor with more than 25% being located in highly distressed census tracts. In addition, the new facility will support the development of 27 to 30 new grocery stores in the Northeast Corridor, including a new ShopRite at the Springfield Avenue Marketplace in downtown Newark. Located in a federally-designated Hurricane Sandy Major Disaster Declaration Area, the Newark Farmers Market project is strongly supported by the Mayor’s Office and the NJ State Economic Development Agency. Also, due to it’s large impact on the local and regional distribution of healthy food to residents that may otherwise not have any choices, the project directly supports the federal Healthy Food Financing Initiative (HFFI). Campus-Northgate, LLC has successfully completed a new retail center consisting of four single-story concrete buildings totaling 31,085 square feet of retail space plus a surface parking lot consisting of 209 parking spaces. The retail center is centrally located in the heart of Louisiana State University's campus in Baton Rouge, LA, and will be targeted to nearby college students. The Northgate Retail Center has helped to address an increased demand for retail goods, services, and community healthcare in the area around the LSU campus. In fact, the retail center directly supports several new large-scale student housing developments which have been built in the immediate area. The Northgate Retail Center transformed a blighted empty lot into an important asset for the LSU area community. The NTC Foundation, a private 501(c)(3) nonprofit corporation, is charged with the preservation and renovation of 26 historic buildings at the former Naval Training Center in the Point Loma area of San Diego, California. Phase 2 is the $20 million renovation of eight historic buildings, known as the Barracks, offering over 75,000 square feet of commercial space. The Barracks serves a creative hub for the NTC Liberty Station Promenade where the public can be engaged by the work of the creative community - artists and designers creating onsite, original clothing, art, fine crafts and food for sale, galleries and exhibitions and nonprofit office space for organizations serving the creative industries. Affordable below-market rent assures tenants of quality space that will not be influenced by market fluctuations and dislocations that often result from neighborhood gentrification and redevelopment. SCR Investments is leading the revitalization of an underutilized former high-end Class A office building in downtown St. Louis which had fallen into disrepair due to mismanagement. The building is being improved and upgraded into 375,000 square feet of Class A office space. The One City Centre redevelopment project will return to the St. Louis downtown a critical office building which through neglect and lack of maintenance had lost all but one major tenant. The rehabilitation includes extensive upgrades to the building's infrastructure as well as tenant improvements for several new tenants. The One City Centre redevelopment project is one of three components of a $220 million redevelopment initiative for the St. Louis central business district aimed at transforming a crucial 3 square block area adjacent to the convention center. Along with the One City Centre redevelopment, the initiative includes redevelopment of the St. Louis Centre and the Dillard's Building. The Project brings much needed investment and jobs into the community. In April 2014, National Beef shuttered the processing plant due in large part to a lack of adequate cattle supply stemming from the 2010-2013 Midwestern drought which decimated domestic herds. At its peak, the former National Beef plant employed 1,300 people and processed in excess of 2,400 head of cattle per day (approximately 2% of total US capacity). One World Beef reopened the plant in October 2016 with approximately 200 employees and plans to grow to 600 employees within a 42-month period. Many of the well-trained employees from the former National Beef operation are still situated locally. 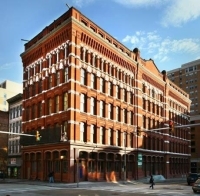 PMC Property Group, Inc. converted the historic, 9-story Reed Smith Building into a 250-room boutique hotel operated by Kimpton Hotels. The Hotel features 10,000 square feet of meeting and event space as well as a 120-seat restaurant. 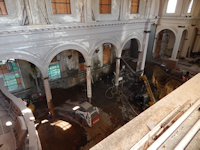 Restoration of the dilapidated building greatly improved a vital area within the Pittsburgh Central Buisness District and provided much needed jobs and investment in the local community. Kimpton Hotels has also partnered with several local non-profit groups to provide important workforce development services to the community. The project received strong support from the City of Pittsburgh and the Mayor’s Office. PMC Property Group, Inc. is converting the historic, 31-story RET Building (formerly known as the Alcoa Building) into a mixed use project with ground floor retail space, office space on Floors 1-13, and 241 rental residential apartment units on Floors 14-31 which includes 50 below-market units reserved for workforce affordable housing. 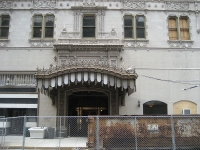 Restoration of the dilapidated historic building will greatly improve a vital area within the Pittsburgh Central Business District and provide much needed residential units while allowing the non-profit and social services organizations currently in the building to renew their leases at below market rates thereby continuing to provide their important services to the community. By creating desirable residential units, the project will catalyze additional services for those residents, including restaurants, coffee shops, retail stores and services like dry cleaners, flower shops, etc. Further, the addition of moderately priced apartments will encourage those who work downtown to live there as well, thereby encouraging a vibrant, livable and walkable city that bustles beyond 5pm. First Class Hotels, LLC has successfully completed the renovation of the hotel, which features 550 hotel rooms, three restaurants, and 70,000 square feet of meeting and event space. 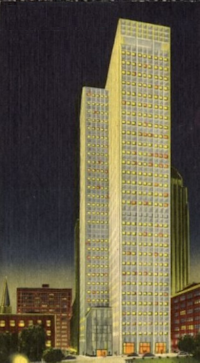 The Roosevelt Hotel is managed by Hilton Hotels and operates under the Waldorf-Astoria brand. Lauded by the City as one of the cornerstone projects for the post-Katrina recovery, the Roosevelt Hotel is one of New Orleans' most illustrious historic buildings. Designed by the Architectural firm H. C. Koch & Sons in 1908, the building subsequently underwent four expansions between 1908 and 1974. The current renovation project restored a cultural icon to New Orleans, including the hotel's famed Blue Room and legendary Sazerac Bar. Having suffered major damages during Hurricane Katrina in August 2005, The Roosevelt re-opened in July 2009. Avalon Partners, LLC and Catalyst Development, LLC have successfully completed the conversion of the historic, 4-story Roth Building into 18 market rate rental apartments on the upper three floors with approximately 6,700 rentable square feet of ground floor retail and office space. The 25,418 square foot Roth Building is located in the CBD of New Orleans, Louisiana which is just south of the French Quarter, the current epicenter of the local tourism industry. The project offers affordable retail and commercial space to local entrepreneurs and small businesses, as well as provides much needed premier housing in the district. SafeRack, LLC has successfully completed the expansion of the initial 95,000 sqft manufacturing facility with the addition of 100,000 sqft that is being used for manufacturing, warehousing and sales. SafeRack LLC (“SafeRack”) is a maker of loading racks, platforms and fall protection equipment. Their product lines include, but are not limited to, loading platforms, gangways, loading ramps, modular crossovers, safety cages and lifeline cable systems. To support its mission of collecting and distributing donated food to more than 500 nonprofit partner agencies throughout six Central Florida counties, Second Harvest Food Bank of Central Florida, a 501(c)(3) nonprofit organization, is constructing a new 100,000 sqft Food Bank Distribution Center in West Orlando, FL, which will replace its existing antiquated facilities. By increasing cooler space by 400%, freezer space by 330%, and overall operating space by 150%, the new facility will allow Second Harvest to dramatically increase its food storage and distribution capabilities and, in turn, provide more food to thousands of people in Central Florida who rely on Second Harvest and its community partners. Currently, over 3 million pounds of available food donations are turned away at the existing facility each year due to inadequate storage space with much of the rejected food items being highly nutritious, perishable food such as fruits and vegetables. By increasing the overall space of the distribution facility to 100,000 sqft, the Second Harvest Food Bank will be able to store and distribute millions of additional pounds of food per year to residents of Central Florida, and in addition, store and distribute a greater percentage of perishable items with higher nutritional content. Put into different terms, the expansion will allow more than 1,000,000 additional meals to be served to children annually. SLS Redevelopment, LLC has successfully completed the development of New Orleans' first large-scale, state-of-the-art film production facility. Consisting of two historic warehouses and a new 18,000-square-foot building, the facility contains 90,000 square feet of production and office space. In partnership with the Kingsley House, a local community organization, Second Line Stages also directs several community initiatives including educational programming for at-risk youth, apprenticeship programs, and neighborhood security and safety initiatives. As the only Hollywood-quality film studio in the Greater New Orleans region, Second Line Stages plays an important role in New Orleans' expanding film industry. The SLS facility is designed to house an entire film production, and contains office space for crew, actors' dressing rooms, soundstages and a 49-seat digital screening theater. Second Line Stages is also the first full-scale LEED-certified production studio in the US. Preservation Initiatives, Inc., led the innovative project to restore 11 adjacent vacant or otherwise blighted buildings along one city block in Downtown Wilmington. The Ships Tavern Row re-development created 39 market rate rental residential apartments, 13,000 square feet of street level retail space and 11,000 square feet of basement storage space. The row of historic buildings along Ships Tavern Row includes the former Lippencott Department Store Building, one of Wilmington's premier late-19th century architectural works. In what was previously a dilapidated block, a highly successful new Destination District was created, which dramatically improved the area's level of pedestrian and commercial activity, as well as enhanced the neighborhood's prospects for the future. Johnson Development, LLC has successfully completed the construction of the new hospital facility for the Singing River Hospital System. The new building contains physician suites, an outpatient imaging center, physical therapy and cardiopulmonary rehabilitation activities, as well as a comprehensive wellness center with aquatics. Singing River Healthcare System (SRHS) has provided world-class health care for the citizens of Jackson County and southern Mississippi and Alabama for over 75 years. SRHS is a community health system comprised of six community medical clinics and two state-of-the art hospitals, including Singing River Hospital in Pascagoula, which is licensed for 435 beds, and Ocean Springs Hospital in Ocean Springs, which is licensed for 136 beds. The development of the new medical office building at Singing River Hospital enabled the Singing River Hospital System and its 2,500 employees to integrate important new services into SRHS while continuing to provide world-class care to the greater community. Union Gospel Mission, a 501(c)(3) charitable organization, has successfully completed the 3-story shelter which provides 40 units of temporary and transitional housing, as well as support services, for homeless women and children in Northern Idaho. The UGM Women and Children's Shelter provides food, clothing and shelter without charge to women and children in Northern Idaho. The main shelter building includes a kitchen, dining room, medical clinic, chapel, classrooms, computer lab and child care center. In addition, the Union Gospel Mission also provides individual and group counseling, classes, vocational training, and addiction recovery lasting approximately 18 months. The UGM Women and Children's Shelter project in Coer d'Alene, ID mirrors similar successful shelters that are located in Spokane, WA and currently run by the Union Gospel Mission. 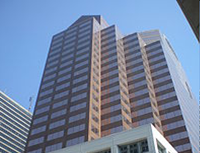 PMC Property Group, Inc. has successfully completed the conversion of the historic, 12-story Verizon Building into a mixed use project containing a 78,000 square foot established charter school on the lower levels and approximately 158 rental apartment units on the upper eight floors, including 40 affordable residential units. The City High Charter School currently serves approximately 560 9th through 12th grade students of which 65% are low income as measured by the federal free/reduced lunch program and 14% receive special education services. The Verizon Building Project allowed City High Charter School to expand its physical facilities, improve upon its educational capabilities, and admit 30 additional students in keeping with its mission. B&B Properties of Vineland, LLC is in the process of completing a new retail shopping center consisting of a ShopRite grocery store, a non-profit Federally Qualified Health Clinic and pharmacy, and three additional retail units. The project is located in a Federally-designated Medically Underserved Area and Food Deserts Census Tract. The Vineland Crossing Grocery & Retail Center will provide downtown Vineland and the surrounding community with a full-service supermarket providing increased varieties of healthy food choices at competitive pricing while participating in Special Supplemental Nutrition Programs such as electronic food stamps and WIC (Women, Infants, and Children) assistance programs for qualifying low income individuals. In addition, the retail shopping center will feature a Federally Qualified Health Clinic serving 5,000 patients a year as well as a pharmacy participating in the 340B Drug Pricing Program. It is anticipated that development of the Vineland Crossing project will catalyze further retail development in the Landis Avenue Corridor, which will in turn lead to additional economic development in downtown Vineland. The New Brunswick Development Corporation and Pennrose Properties transformed an underutilized downtown New Brunswick site into a major transit-oriented, mixed-use facility focused on community health. The New Brunswick Wellness Plaza consists of a state-of-the-art, 9-story mixed-use building comprised of a 49,000 square foot supermarket, a 62,000 square foot wellness and fitness center (including an aquatic center) and a 474,000 square foot public parking garage with 1,275 parking spaces. In addition, the project incorporates the development of outdoor public space and the construction of a direct connection with the NJ Transit train platform located along the Northeast Corridor rail line. The New Brunswick Wellness Plaza development has provided downtown New Brunswick with its only full-service supermarket, as well as a wellness, fitness, and aquatic center offering a variety of health-oriented services unavailable in New Brunswick since the city lost both its YMCA and YWCA many years ago. The project is part of the larger "Transit Village Redevelopment Initiative" undertaken by the City of New Brunswick to systematically add housing, retail, office, parking, and transportation infrastructure to downtown New Brunswick. The City of New Brunswick and State of New Jersey were major supporters of this project. Whitehouse Hotel, LP has successfully completed the renovation of the hotel, creating over 500 luxury rooms and suites in addition to the hotel's other premier amenities. The Whitehouse Hotel is managed by Marriot/Ritz-Carlton and operates as The Ritz-Carlton, New-Orleans. Known as the "Crown Jewel of the Crescent City", the Whitehouse Hotel (built 1908) occupies two historic Canal Street buildings in Downtown New Orleans. The Hotel suffered extensive mechanical and infrastructure damages in August 2005 during Hurricane Katrina, necessitating a major renovation. The successful renovation of the Whitehouse Hotel, completed in 2007, marked a key milestone in the recovery of New Orleans and New Orleans' hospitality industry. The Winston County Medical Foundation has successfully completed the new Winston Medical Center which is a 24 bed full-service hospital, 120 bed long-term senior care and rehab facility and medical office building. The hospital has an estimated 20,000 patient visits per year, as a Rural Health Clinic it will serve approximately 7,500-8,000 patients per year and the nursing home will serve 120 residents, equating to 43,800 resident days per year. As a result of being located in a low-income area, Winston Medical provides a larger amount of charitable care than the national average.